Little Witch Academia: Chamber of Time is an action role-playing video game developed by A+ Games and published by Bandai Namco Entertainment, based on the anime franchise Little Witch Academia. The game was released on the PlayStation 4 in Japan in November 2017, and worldwide for PlayStation 4 and Microsoft Windows on 15 May 2018. 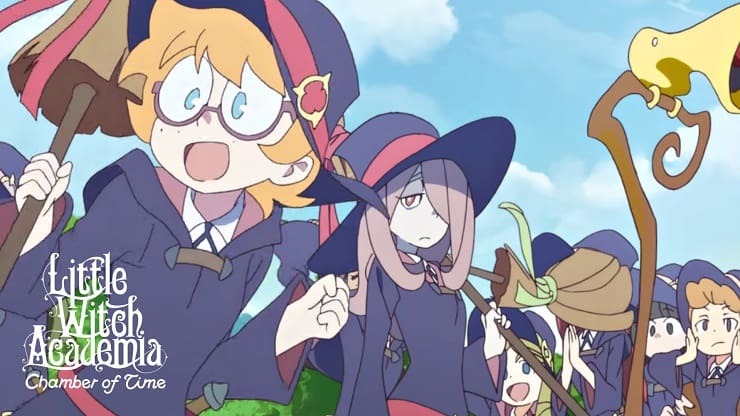 The side-scrolling action game lets players control the anime’s protagonist, witch-in-training Akko, accompanied by her friends Sucy and Lotte, as she explores her magical academy. A limited edition with additional material, including an audio drama and an artbook, was released in Japan. The game features animated cutscenes by Studio Trigger, the creators of the anime. Wikipedia®. Uncover the mysteries at Luna Nova Academy and experience the magical world of Studio Trigger style Japanese animation. Join Akko and her friends to work as a team – exploring dungeons, casting magical spells and using witchcraft to ultimately discover the seven wonders and solve the mysterious shift in time. Believe in the magic and utilize power and friendship in this side-scrolling action RPG beat ‘em up. Studio Trigger Style Animation – Get a glimpse into the world of Little Witch Academia from the world renown Studio Trigger, with Exclusive cutscenes made directly be the Anime Studio! Simple and Fun Gameplay – RPG elements and side-scrolling action allows fans to level-up their characters and find drops that enhance builds while exploring. Live the Anime – Follow the familiar storyline, a Heart-warming, funny and cute story for the entire family. Trainer for the game Little Witch Academia: Chamber of Time, you can use it to activate these essential Cheat Codes: Infinite HP, Infinite MP, Super Speed, Infinite Jumps, Infinite Stats Points, Infinite Magnitude Points, One Hit Kill, Infinite Coins, Infinite Spellstones, Infinite Experience. Note: This cheat tool is for the original version v1.0 of the game Little Witch Academia: Chamber of Time.